"Theo", Van Gogh wrote to his brother, "I am decidedly not a landscape painter; when I make landscapes there will always be something of a figure in them.” It seems an odd thing to say if untrue so let's take him at his word: where is the figure in this landscape? With so much snow, a conventional figure would stand out clearly but there is none. However, here at EPPH, we claim art's true meaning is esoteric and rarely seen. Click on the image to see it more clearly. Then move on when ready. 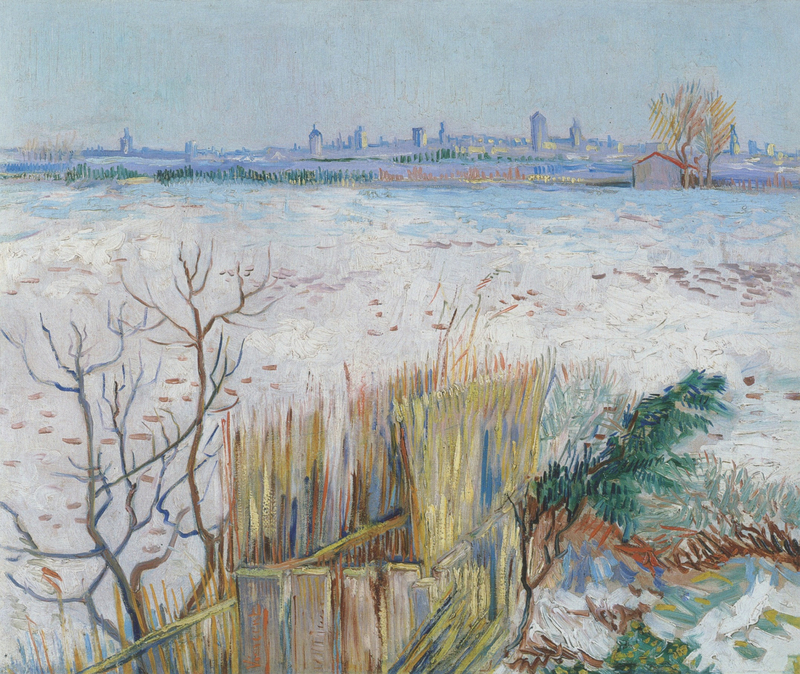 Van Gogh, Snowy Landscape with Arles in the Background (1888) Oil on canvas. Private Collection. Let us look at another of Van Gogh's paintings first. Even though he copied it from a monochrome engraving by a mere illustrator, it is painted in his signature style and, as I revealed on the blog recently, includes a contribution of his own invention. That then changed the meaning of the picture and made it art. Van Gogh, L'Homme est en mer (1889) Oil on canvas. Private Collection. As you can see at far left, his own image appears amorphously in the fireplace, painted in the same colors and light as a self-portrait from the same year (inset). Note the blue of his "eyes" in the flames. 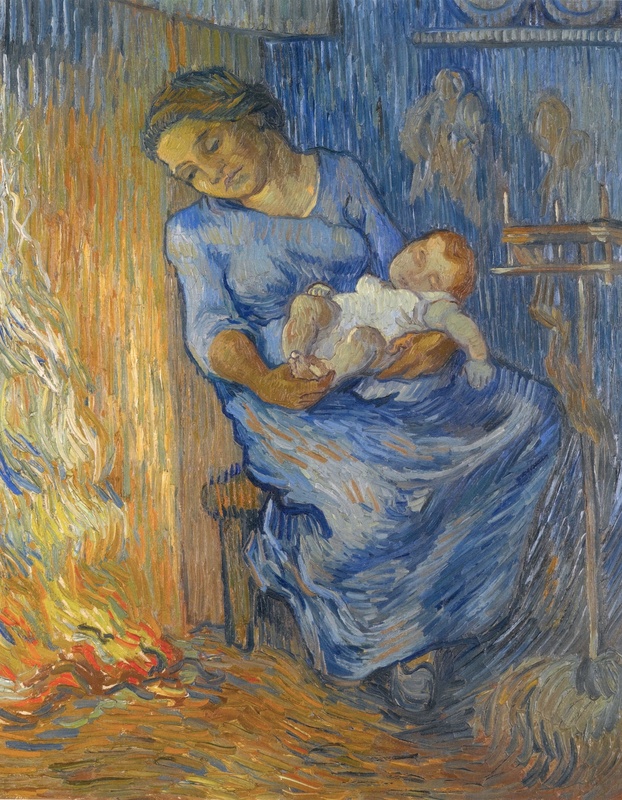 Fire leaps out of his mind as he imagines "his painting" of a mother and child next to him. This reverses conventional expectations of "reality" and abstraction but is in keeping with art's traditions. The "artist" is distorted as in a dream because the whole picture is a mental image; mother and child look "real" because paintings did. What we see is the very conception of this picture in his mind because, being a philosopher, he was awake to the present moment, the only time life happens. A scene of a past or future event is not reality. Most people think non-abstract art depicts exterior views, rarely imagining that the setting is internal. Where, though, is the figure in the snow? See how the upright stalks emerge from the ditch, like the flames from the fire, again in the same colors as his typical self-portrait. They also resemble paintbrushes pointing towards the town above. The ground, the correct term in art for an unpainted canvas, is white like the gesso artists use too. Perhaps he imagined his gessoed canvas as snow or imagined the snowy scene as his gessoed canvas. And just as his "brushes" shoot upwards from the ditch, he signed his name in that direction on one of the wood planks (bottom). Vertically. That is so unusual that it must be a clue. And so it is. If the painting is turned to the right to make the signature horizontal as I have done at left, an even more amorphous self-image appears made from white highlights and blue shading. Compare it (top left) to the contemporaneous self-portrait (top right). The reddish-brown undergrowth extending down his "cheek" has the texture of his straw-like beard painted in short straight lines (top). It is also the color of the contour under his chin. A green branch, the color of fertility, crosses above his "eyes". The yellow above that suggests his straw hat with the strokes turning upwards on the left like its brim.1 See diagrams below for guidance. 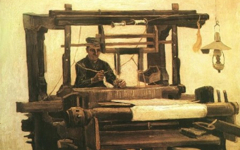 Top R: Van Gogh, Self-portrait with Straw Hat, detail (Summer 1887) Oil on canvas. Van Gogh Museum. 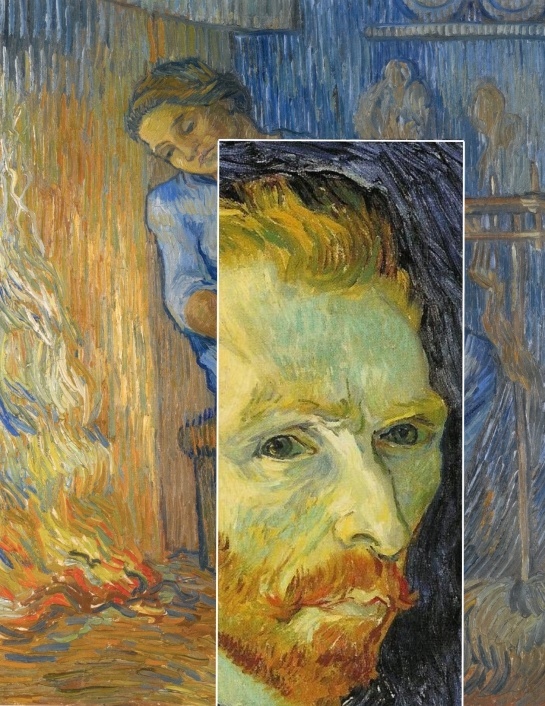 Look again at the full composition right-way up and see how, as in the fireplace, color explodes from Van Gogh's mind towards the "unpainted" canvas above. That's why the "brushes" and signature point upwards too. He is "in the process" of conceiving the picture we see.2 What, though, is down in the ditch? That mystery is hidden in the depths of Van Gogh's mind. 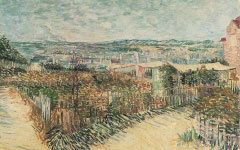 For similar landscapes, see Van Gogh's Trees and Undergrowth (1887), his Vegetable Gardens at Montmartre (1887) and his Cypresses with Two Female Figures (1889). A small selection by other artists on EPPH include Leonardo's Virgin of the Rocks (1483-6), Albrecht Dürer's Death of Orpheus (1494), Rembrandt's Landscape with a Stone Bridge (1638), Guercino's View of a Lake (c.1610-66), Corot's La Ronde Gauloise (1857), Degas' Rocks and Trees...(1867), Monet's Camille Monet in the Garden...(1876) and his series on Rouen Cathedral (1892-4), Cézanne's Bathers (1899-1904), his Large Bathers (c.1906), Renoir's Le Cannet (1902) and Balthus' masterpiece, The Mountain (1937). For another picture of surprisingly similar composition that needs turning to reveal the face, see Poussin's Ordination (1640's). See why knowledge of a painter's practice can lead to a different, and more accurate, interpretation of a scene. 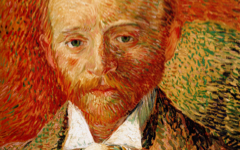 One of Van Gogh's first portraits in France of someone other than himself was "himself"
1. 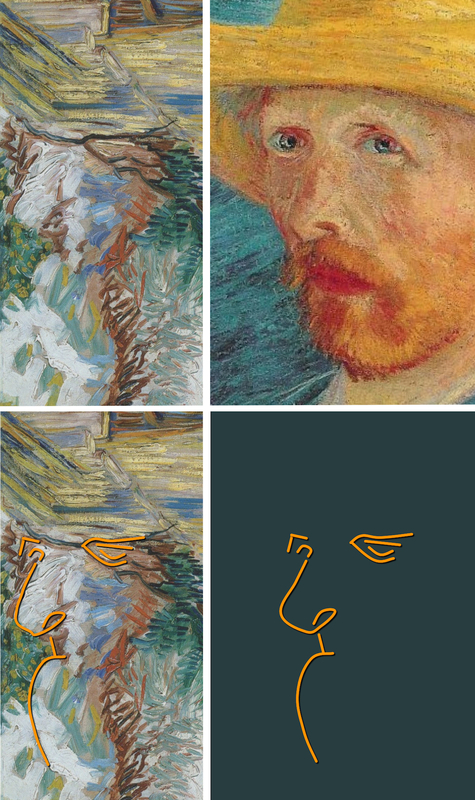 The frequency with which Van Gogh wears a straw hat in his self-portraits suggests that he also thought of straw-stalks around his head as a symbol of creative fertility like the stalks shooting up from the ditch. 2. The frame around the ditch may represent the "frame" or "wood stretcher" of his imagined composition. 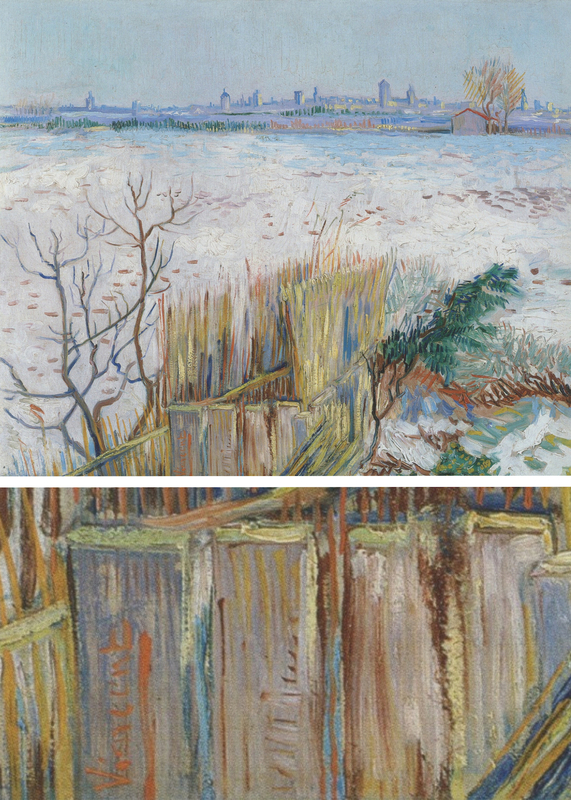 It is also in the form of a "V" extending into the scene, a shape Vincent often used to represent his own initial. Original Publication Date on EPPH: 30 Aug 2012. © Simon Abrahams. Articles on this site are the copyright of Simon Abrahams. To use copyrighted material in print or other media for purposes beyond 'fair use', you must obtain permission from the copyright owner. Websites may link to this page without permission (please do) but may not reproduce the material on their own site without crediting Simon Abrahams and EPPH.